Is the MeetMe App Safe for My Kid? The Complete App Review for Parents. 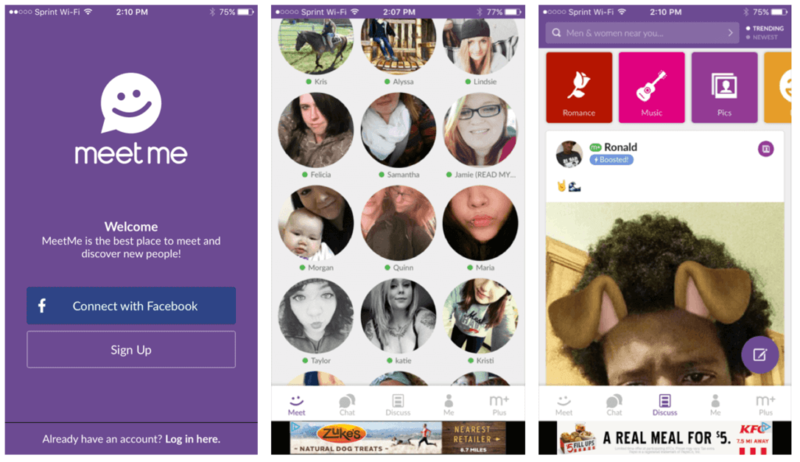 Formerly known as the myYearbook app, MeetMe differentiates itself because it introduces users to new friends instead of connecting you with old ones. New users can create an account by using an email address or an existing Facebook account. Once registered, you can create your own profile (third image), you can see profile pictures (middle image), and choose to message MeetMe members if you would like. Users can also browse through the newsfeed of nearby people, similar to the feed you might see on Facebook. APP Store rating: 17+ infrequent/mild alcohol, tobacco, or drug use or references, profanity or crude humor, frequent/intensive mature/suggestive themes. What do parents need to know about the MeetMe App? It’s a dating app: make no mistake – just below the surface, MeetMe is aiming people towards an on-line hook-up (its sister app is Skout, which is a well-known teen and adult flirting app). As part of the app registration process, you are asked your purpose as “friends” or “dating” and it creates a user experience based on your selections. After only being active in the app for a few minutes, it already was feeding me females to chat with in my community (because I set my profile as “male” and “seeking women”). The App Store rating is accurate: when the Apple App store considers an app to be 17+, then parents should listen. A secular, revenue-driven entity does not think the MeetMe app is appropriate for most high school students. This is important. Predator risk is high: this is a given with 100 million people using the app, which is bound to have trolls lurking. In 2015, the app was named one of the top six adult dating apps used by teens. This should be a huge red flag for parents. And, since this app connects people based on geographic proximity, the predator risk is very real. MeetMe is social media in every sense: chatting with strangers, trading pictures, taking an anonymous poll, adding friends. But again, it’s social media with a flirting/dating/hook-up bent with features like “Rate Me” and “Romance” which is a wall of pictures of mostly females. Privacy controls do exist: you can control who sees certain parts of your MeetMe profile by clicking on the “me” icon at the bottom, then “settings” at the bottom, and then “Privacy and Content” where you can toggle off “Include me in Meet” which will keep your profile out of the “Meet” stream of profiles in the main navigation. **NOTE: the default privacy settings are OFF unless you manually go in and change them, making almost every part of your profile public. In-app purchases: you can upgrade your account to Meet+ to remove ads, unlock more photo options, the ability to filter other users in more detail (“by body type”). While using the MeetMe app, users are frequently asked to upgrade features by purchasing MeetMe credits. MeetMe bottom line for parents – is it safe for your kid?